One major component of Level 4 and Level 5 driverless cars is in very short supply. Venture capitalists and engineers from around the world are racing to fill the LiDAR production, price, and performance void. Production of LiDAR sensors is seeing months-long production bottlenecks as suppliers, such as Quanergy and Velodyne in the US, are challenged to deliver the technology on time — especially, at a lower cost. Automakers and suppliers are increasingly relying on LiDAR (light detection and ranging) sensors, which emit laser lights that detect objects surrounding the vehicle. LiDARs detect, measure, and recognize objects and are used to process the information to enable self-driving features. There is indeed a backlog of orders, which we are seeking to address immediately with the production upgrades we are instituting. Uber, in its response to Waymo's lawsuit claiming it stole intellectual property for its self-driving car fleet project, also described the LiDAR shortage. Lawyers representing Uber, which uses Velodyne's LiDARs, wrote in response to Waymo's complaint that Uber's "primary supplier for the cars currently on the road cannot meet the demand for its LiDARs." While self-driving cars have emerged as a one of the hottest applications in the tech sector, their ultimate success (or failure) largely hinges on the successful development of LiDAR. In some cases, carmakers have sought ways to use alternatives to LiDAR; Tesla's founder and CEO Elon Musk spoke in 2015 about how Tesla models will not use LiDAR, and that the carmaker was opting for sonar, radar, and passive camera systems instead. But after Musk made his anti-LiDAR announcement, there have been spy shots published of a Tesla Model S prototype being tested with a LiDAR device mounted on it — which Tesla claims is for calibrating their other sensors. Rhetoric aside, even Tesla will eventually need to adopt it in Level 4 vehicles, according to Anirudh Venkitaraman, an analyst for Frost & Sullivan, a market research and consulting firm. "The LiDAR sensor is gaining utmost importance in being one of the primary enablers of autonomous driving," he told Driverless. A number of startups are rushing to the meet the technology and supply vacuum. Besides Velodyne and Quanergy, they include US-based Luminar Technologies and Dutch supplier Innoluce. The technology is becoming increasingly competitive with several startups working on improvement, and major Tier-1 suppliers gearing up to join the race with their product range. This growing competition has motivated technology developers to be the first-to-market to come up with an affordable LiDAR. Carmakers such as BMW, Mercedes-Benz, Tesla, Volvo, and others are actively developing Level 3-enabled cars and are expected to be able to add level 4 and more advanced features to their models within a few years. Among the startups that are positioning themselves in hopes of becoming the ultimate mobility disrupters, Uber and Google's Waymo continue to wage a technological and legal arms race to be the first to offer driverless cars as a core part of their services in the future. But despite industry claims that mass-volume sales of self-driving cars are just around the corner, suppliers continue to struggle with designing LiDARs that meet the demands the application requires. Carmakers know what they need for level 4 features for their car launches in 2020 and later, but suppliers are also still perfecting the technology, which is not ready to meet the specifications the OEMs and tier-one suppliers need, according to Venkitaraman. The LiDAR market is expected to remain in the nascent stages for the next two to three years as the technology continues to evolve. There are different types of technologies that can make their way to market and deciding which one is right for different levels of autonomous driving is ongoing. It's not going to happen overnight. Production bottlenecks are largely due to the design challenges associated with offering high-volume LiDARs for a $250 per-unit price point. 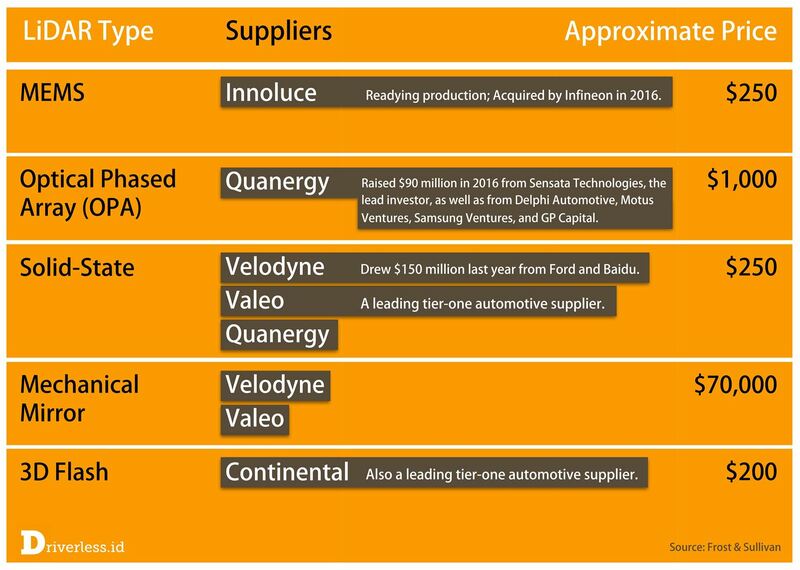 Leading LiDAR makers Quanergy, LeddarTech, and Velodyne are struggling to deliver to tier-one suppliers such as Continental, Denso, and Ibeo, according to Venkitaraman. That price point must eventually come down to below $150 per device. 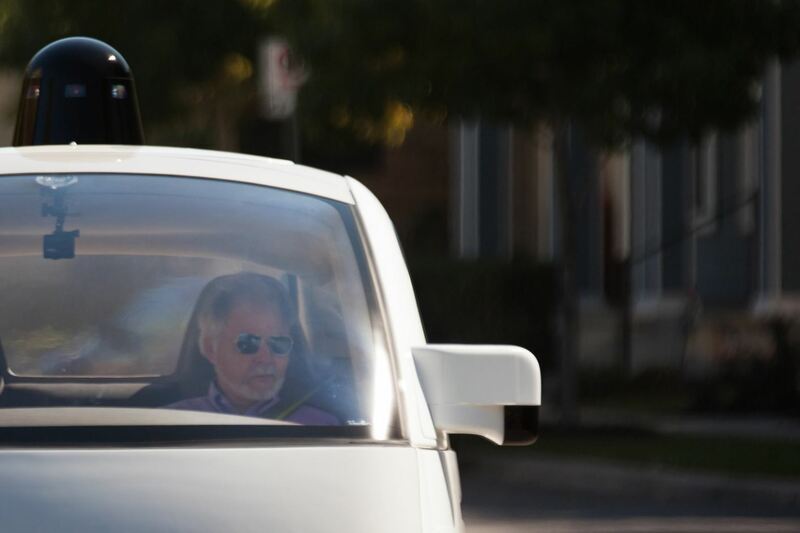 In Waymo's case, its roof-mounted Velodyne LiDARs have a range of more than 200 meters and does 360-degree laser sweeps of the area surrounding the vehicle. These features, and the high data-transfer rate the laser offers, help Waymo stake its claim as having designed the most-advanced autonomous car to self-drive on public roads and streets. However, the $70,000 plus price tag for these LiDARs is obviously prohibitive to volume carmakers. Instead, carmakers and their tier-one suppliers seek robust and reliable $250 LiDARs with ranges of 200 meters or more in the immediate future, according to Venkitaraman. MEMS LiDAR: Uses electromechanical-assisted mirrors to emit single- or dual-beam lasers. It was previously geared for shorter ranges, but can now reach targets of 120 meters and on, according to supplier specs. Solid-state LiDAR: The LiDAR flavor that is going into a high-volume production that has no moving parts. It is geared for long-distance scanning of up to 120 meters and up to 200 meters in the future. Mechanical-mirror LiDAR: Has the capability to offer 360-degree laser-scanning sweeps and is geared for distances up to 80 meters in commercially available devices today, but have a theoretical range of up to 150 meters. 3D flash LiDAR: Emits a single pulse for 3D scans of objects and environments up to 30 meters. Optical phase array (OPA) LiDAR: Geared for short and wide ranges, OPA consist of an optical-scanning device on a microchip. It also uses a phased-array type of laser emitter like solid-state LiDARs do. The maximum range is 100 meters. Solid-state LiDAR that Quanergy, Velodyne, and other suppliers are developing are emerging as a popular choice for driverless cars in the near term. But the solid-state devices are also the source of today's LiDAR production bottlenecks. Among other things, these LiDARs are capable of object detection at longer ranges and with a wider field-of-view compared to other more-affordable LiDARs. Their design also allows them to house a large number of sensors and lasers in a very compact size, a key requirement carmakers have. Solid-state LiDARs are expected to be in high demand for level 4 and 5 autonomous vehicles. But the major bottleneck still remains the price, as these suppliers are struggling to deliver it for $250 or less for now. However, Velodyne, in which Ford and Baidu invested $150 million last year, says its LiDAR bottlenecks will be short-lived. It expects its new plant in San Jose, California, will be able to meet the demand for the backorders and that it will make 10,000 LiDARs this year. The production boost will ensure that we can meet the expected high global demand once mass production of autonomous vehicles begins in the near future. As suppliers scramble to ramp up production to meet the backlog in LiDAR production, carmakers say they foresee no delays in delivering cars with self-driving features on schedule. BMW would not comment on specific supply chain issues, while Dirk Wisselmann, an expert in functional integration autonomous driving at BMW, said the carmaker was not affected by any supply chain delays for LiDAR "at the moment." With the numerous activities of different suppliers and as new technology becomes available, such as solid-state LiDAR, we are confident we will be ready for series production as of 2021 for the BMW iNEXT. A spokesperson for the Renault-Nissan Alliance, which is expected to be one of the top-10 volume producers of self-driving cars worldwide, could not comment about potential LiDAR production problems its suppliers might have. What we can tell you is that the Alliance is on track to deliver more than 10 vehicles with autonomous drive technologies by 2020. LiDAR is also not the only technology required for level 4 and level 5 self-driving cars. Cheaper components such as radar, ultra-sonic devices, and camera systems will also remain in use to complement LiDAR, which becomes less accurate in rain, snow, and other low-visibility driving conditions. We need to ensure redundancy when one technology might not be enough to handle the current driving situation, especially in bad weather conditions. We also need this for our fail-operation strategy to ensure that even when one system fails, the self-driving vehicle still works. Given LiDAR's features and falling prices, most, if not all, carmakers should rely on these sensors at some point in the future for driverless models — despite today's production bottlenecks.